The smoke has been bad the last few days. It is blocking out the sun, obscuring views and adding an extra strain on the lungs. The desire to get outside is usually not too strong when conditions are this miserable. Nonetheless, exercise is still a good thing and getting out of the house remains important. If one is willing to put up with breathing it in (certainly a subjective proposition), there are still some really good trails around Mount Shasta that can be enjoyed when skies are hazy and views minimal. For the most part, these are lower elevation hikes that stick close to creeks and rivers. The forest canopy will often filter views naturally and force hikers to focus on the more immediate delights: the trees, the rushing water (yes, even late in summer during a drought! ), the rocks, the flowers and the grasses and other things that line the trails. Indeed, the smoke may be discouraging but count it a blessing, head outdoors and enjoy those things that we often overlook at this time of year when we often hike the high trails. The hike through the dense forest along this section of the Sacramento River is a delight any time of year. Like other riparian areas, attention is placed squarely on the river and the surrounding forest. The river’s canyon is so large and vast that it almost seems as though there is no canyon and it is flowing through a flat, forested expanse. Yet the forest is fantastic. Firs, pines and the rare yew tree line the water and shade the easy trail comfortably. There is plenty of opportunity to pause, sit on large rocks and enjoy the river as it races by. This is a kid friendly hike with lots of tidepool-like potholes that invite lots of exploration and play. Journeying into the steep, isolated terrain around the lower McCloud River, the hike along Squaw Valley Creek is one where there are few opportunities to observe the sky. Any smoke or haze is all but forgotten here, as the alluring creek consumes hiker’s attention and the forests cover the sky. This hike can be done as either an out and back or as a loop. The former follows the main trail along the namesake creek. This is the prettiest part of the hike. However, the loop option follows an old road along Bear Trap Creek. This section of the hike passes through the heaviest forest and here the canopy is the most opaque, almost completely suffocating any view of the sky. When fires are active and the skies are covered with smoke, this is a great place to lose oneself in the forest and enjoy the peace that is found in this remote area. The remote North Fork of the Sacramento. 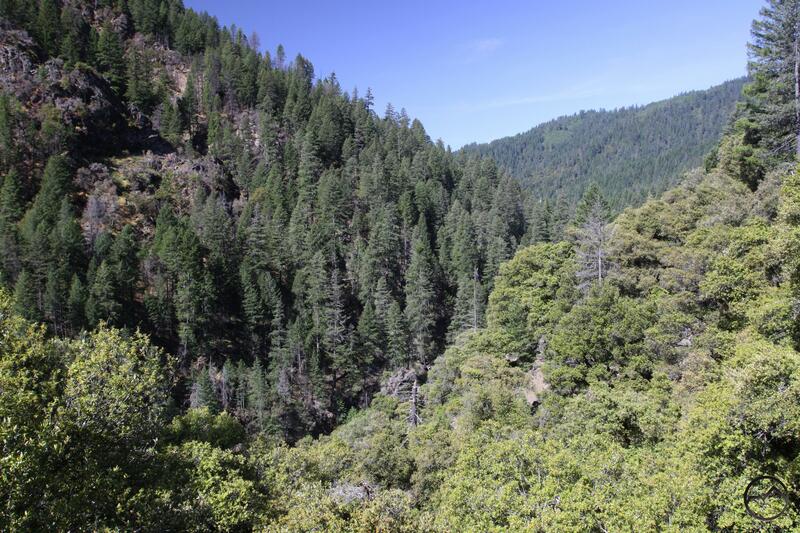 This long trail plunges deep into the dark forests that occupy the canyon of the North Fork of the Sacramento River. The river is not particularly large along this section of trail (especially late in the drought-ravaged summer) but the flow is still pleasant and the canyon is deep, remote and beautiful. While it is usually recommended that the trail be hiked from Parks Creek Pass through the Deadfall Lakes and then down into the North Fork Canyon, when the skies are smoky, begin at the North Fork trailhead and hike upstream through the canyon. The path will pass through remote forests and along geologic oddities. The skies are visible at times, which means the haze is still a part of the hike, but the eye is always led back to the fledgling river and the surrounding forest and canyon. 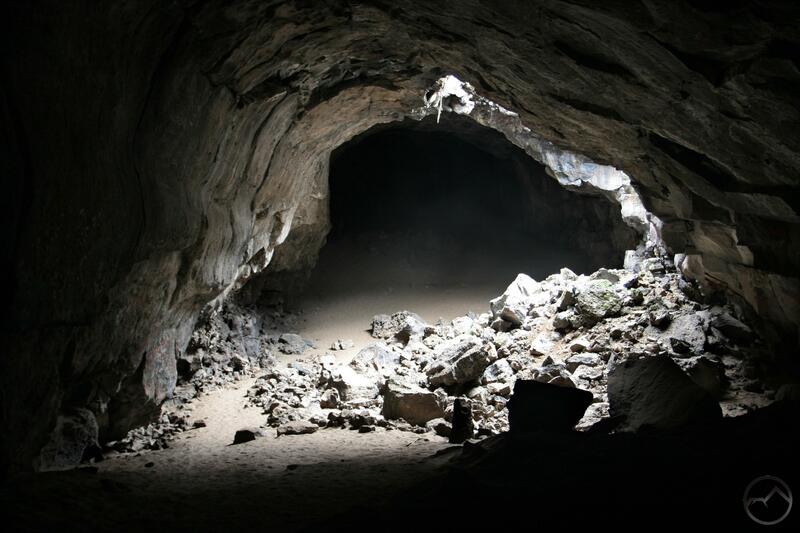 Rather than hike through the deep forests, the Pluto’s Cave Trail heads underground into the deep earth. The first part of the hike is certainly through open terrain that is very susceptible to hazy skies and smoky conditions. Mount Shasta might not be visible but plenty of interesting, smoke free hiking waits ahead. Once hikers arrive at the cave, all attention is drawn downward into the great cavern. The trail leads through the ruins of the lava tube, winding beneath arches and around boulders before heading into the skyless darkness of the cave. Initially there is still some light in the cave, provided by a small collapse in the ceiling. Beyond this another collapsed section boasts an unusual forest within the cave. Beyond this point, it is a mile of dark tunnel ahead, beckoning the adventurous to go forth. 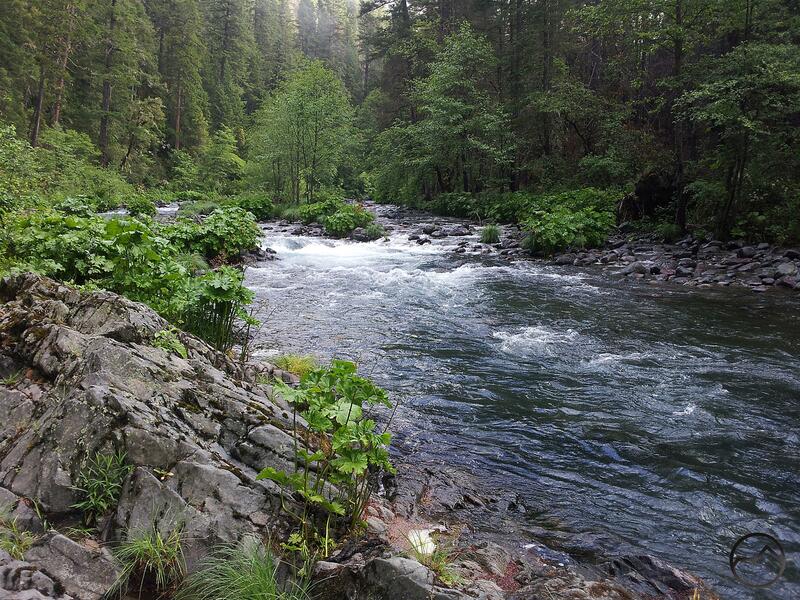 The McCloud River Preserve is remote and requires a long, bumpy ride to reach it. However, once there, hikers can enjoy one of the finest riverside trails around. The McCloud is large and full and there are plenty of rocks to scramble on and enjoy. However, the canyon is so deep and narrow and the forest so ancient and towering, that little of the sky is visible. Here you can enjoy the river in its prime with no worries about the hazy skies. This is a primeval land where the outside troubles can be forgotten and the blessed river appreciated. Mount Shasta is an awesome sight from the Clear Creek Trail. The small town of McCloud does not often get brought up as a great hiking destination. It is widely recognized as a beautiful, historic and peaceful community and a great vacation getaway. Yet, it is not mentioned as the place to go for a plethora of great trails. 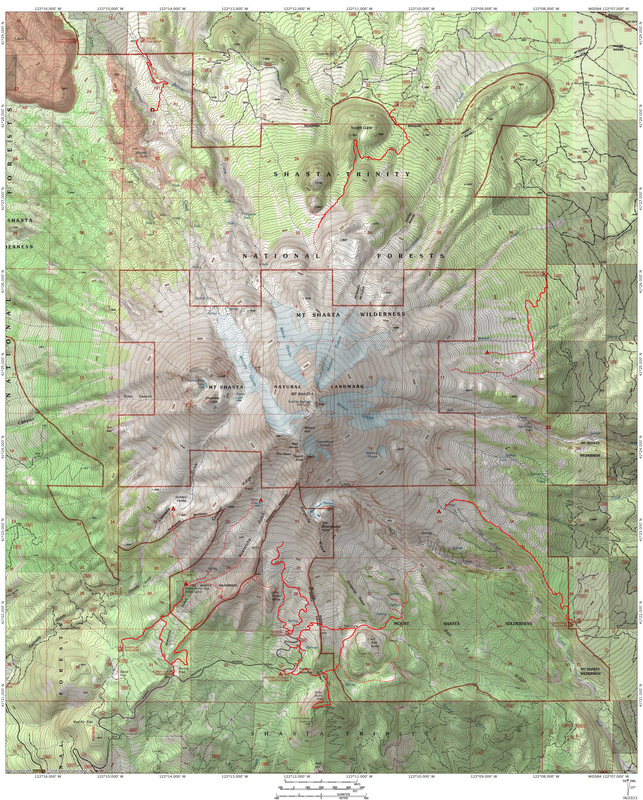 Nearby Mount Shasta City generally takes up all the oxygen as the hiking epicenter. This is for good reason, given its proximity to the Everitt Memorial Highway (the only paved road up Mount Shasta), the Trinity Divide, and the abundance of trails immediately outside the city. Yet Mount Shasta City’s accolades should not come at McCloud’s expense. There are a variety of fantastic trails located not far from town. 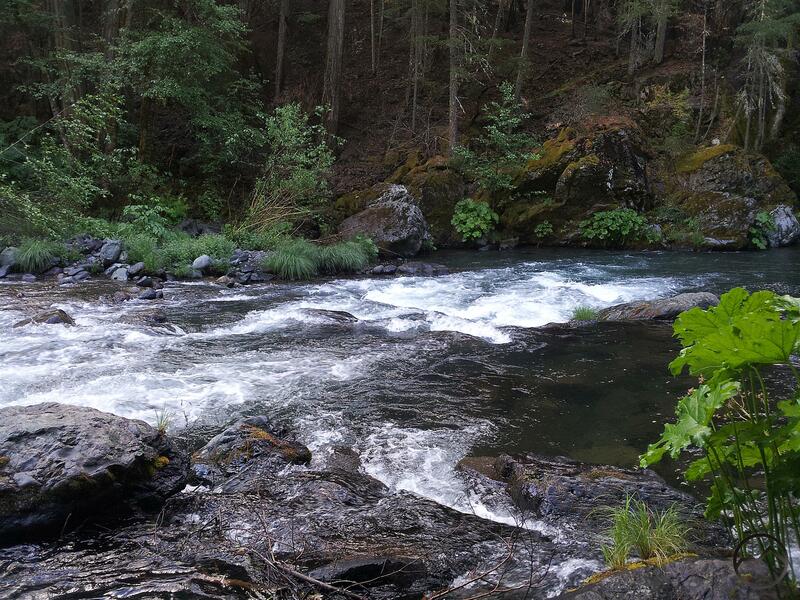 The McCloud River naturally comes to mind as the top attraction but there other paths of spectacular beauty found outside of McCloud that deserve recognition. The best of these are the trails on Mount Shasta itself. Though not often considered in this context, McCloud is the gateway to the east side of the mountain. Despite being a bit of a drive from town, hiker must pass through McCloud to get to them and these are some of the best trails on Mount Shasta. 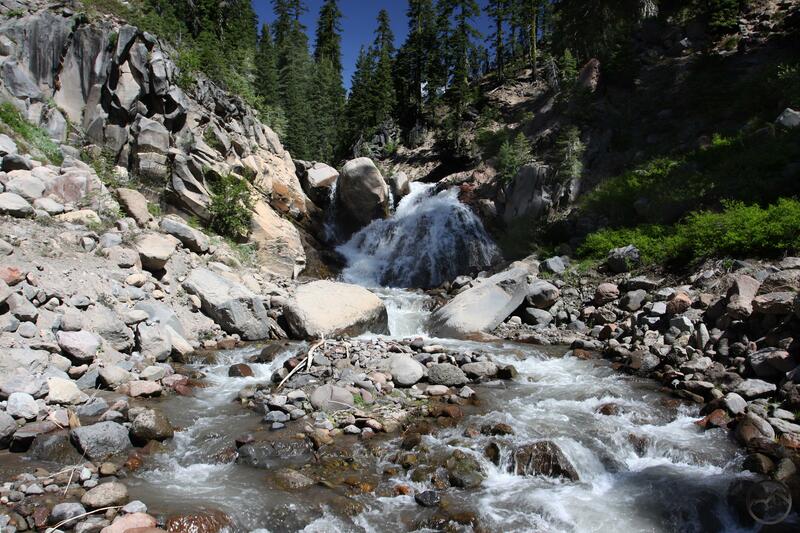 Whether it is the high trails on the mountain or roaring waterfalls, McCloud has a lot to offer hikers, even if it does not have a great reputation as a great hiking destination. 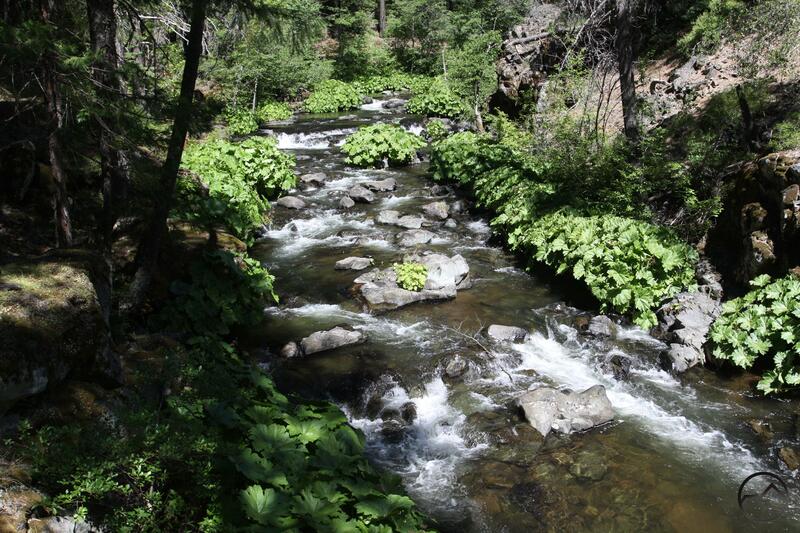 The trails of the Upper McCloud River are probably the first that come to mind when thinking of Mount Shasta. Here hikers will find the river’s famous trio of waterfalls. 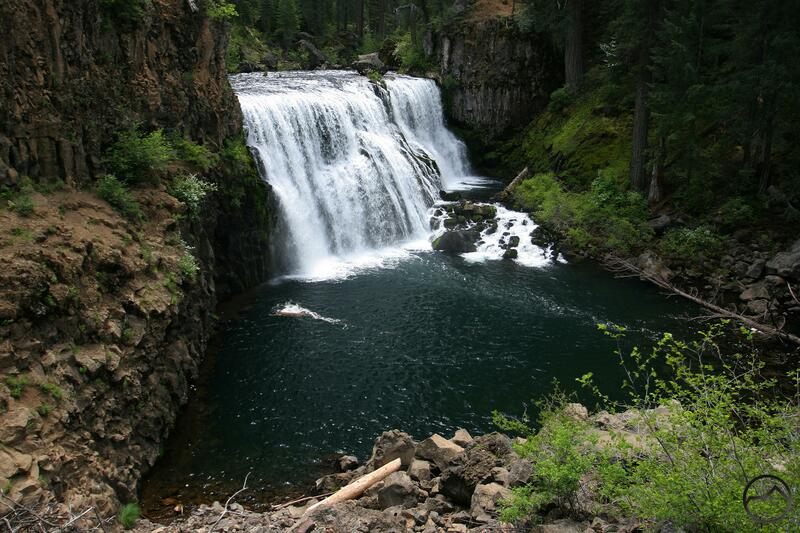 The falls are among the most popular destinations in McCloud and deserve to be so. The trail connecting the three cataracts is an awesome path that hugs the river, exposes fascinating geology and offers many excellent views of the waterfalls. Yet the spectacle of falling water makes it easy to overlook the rest of the great trails in this area. The falls trail is really just a small section of the McCloud River Trail, a long track the parallels the river from the Algoma Campground to the Pine Hollow River Access, downstream from Lower Falls. Though the rest of the trail lacks the drama and power of the waterfalls, it is still a wonderfully beautiful hike with solitude, great swimming holes, old forests and the ever present river right along the path. The entire trail can be broken up and hiked in sections, making numerous day hiking opportunities. It is also possible to the whole trail as one long shuttle hike. 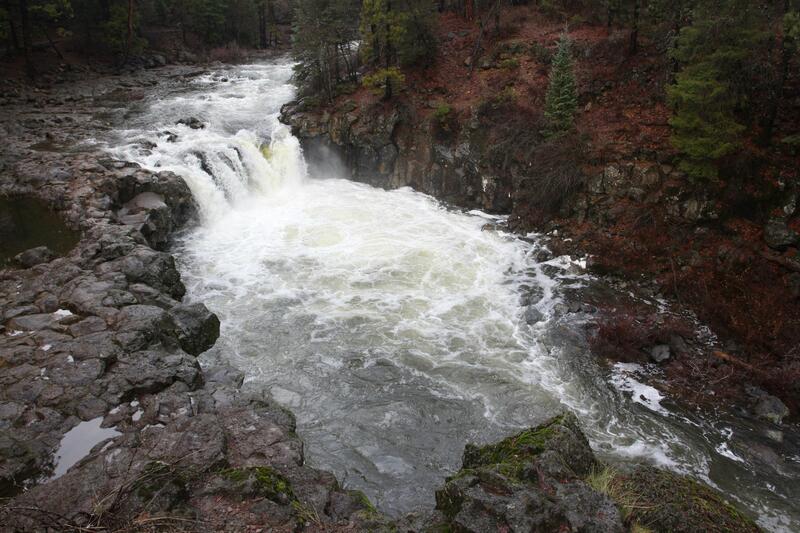 Whether hiking the awesome section along the falls or wandering the lonely course of the McCloud River Trail, hikers won’ regret a trip to the Upper McCloud. 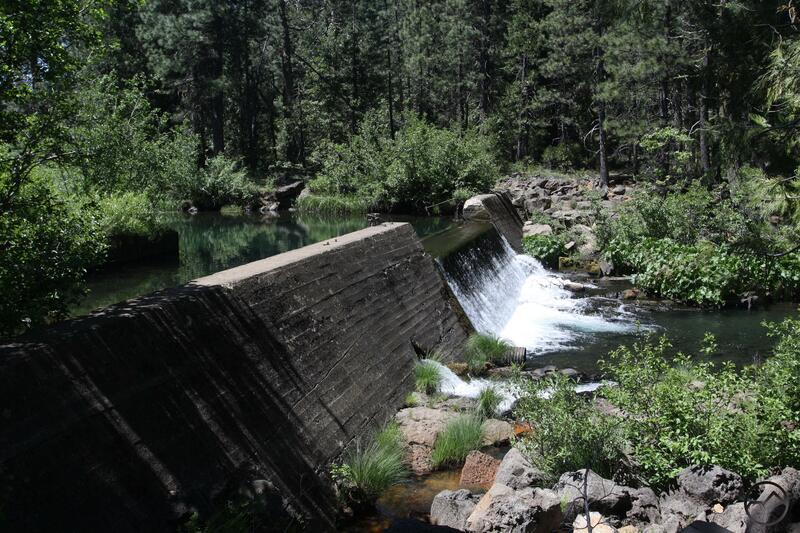 Lake McCloud is the functional point of division between the upper and lower sections of the McCloud River. This also marks the transition from the volcanic geology of the upper river to the marine sediment of the lower portion. 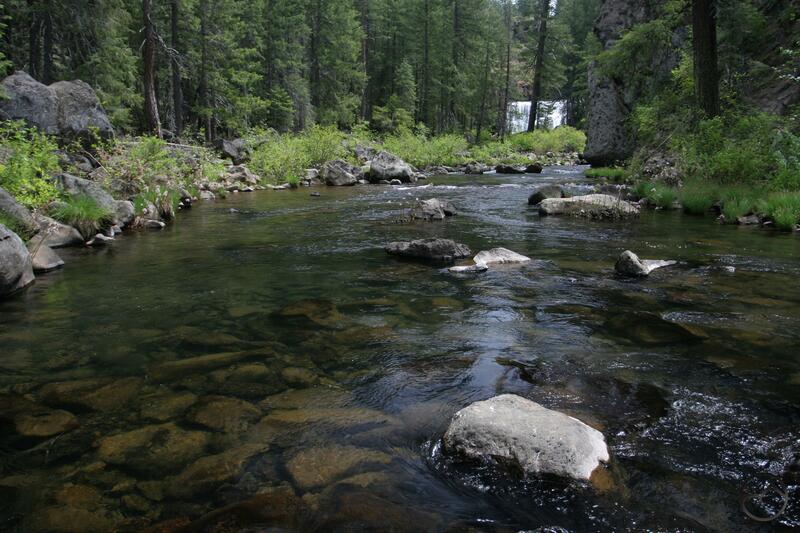 Though geologic shift is generally unheralded, it does mean that the river has noticeably different characteristics downstream from Lake McCloud. This area is characterized by deep, rugged canyons, ancient forests and sporadic, rocky crags erupting through the trees. The rock in this area is much older the more recent volcanic rocks upstream. Hiking here means few crowds and lonely trails. The most popular trail is not on the McCloud but the Squaw Valley Creek Trail. 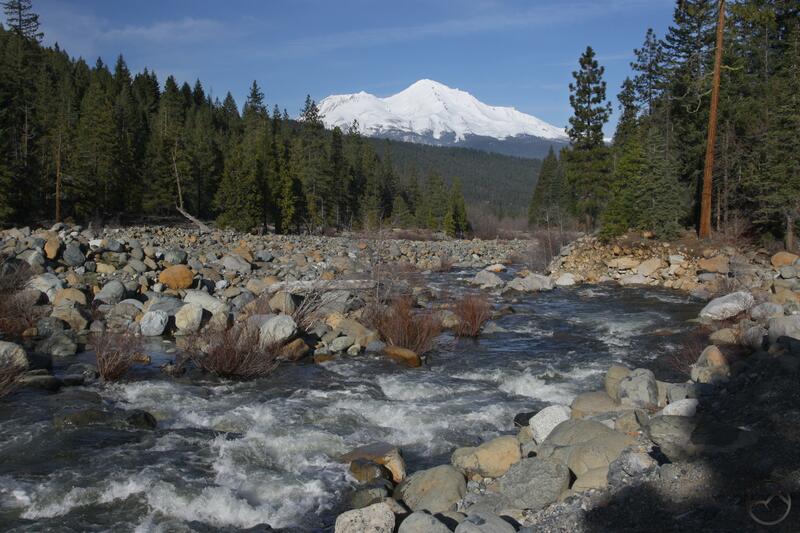 This waterway begins at South Gate Meadow high on Mount Shasta and flows nearly 35 miles to its confluence with the McCloud River. Other trails in the area include the Pacific Crest Trail and the remote but gorgeous route through the McCloud River Preserve. One does not usually associate McCloud with trails on Mount Shasta yet the fact remains that two of the best trails on the mountain must be accessed from McCloud. The Clear Creek and Brewer Creek Trails are splendid alpine hikes that boast numerous superlatives. 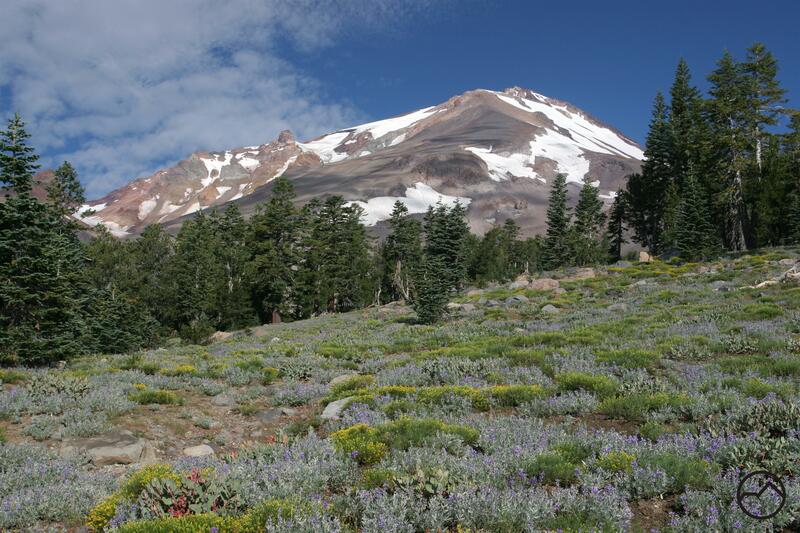 They climb high above treeline, have incredible views of Mount Shasta and many of its attendant glaciers, views of magnificent waterfalls and views of much of Northern California lying to the south and to the east. Delicate meadows and clear-running streams are found along these paths, as are ancient forests of trees that are large and robust as well as stunted krummholz forests. Simply put, these are two of the best trails in Northern California and McCloud should lay claim to them, since it is necessary to pass through town to reach them. Mount Shasta towers above the Ash Creek Butte Rock Glacier. Granted, there is not much recreational infrastructure to the east of Mount Shasta. However, for the motivated hiker there is a lot to explore if one is prepared to hike without maintained trails. 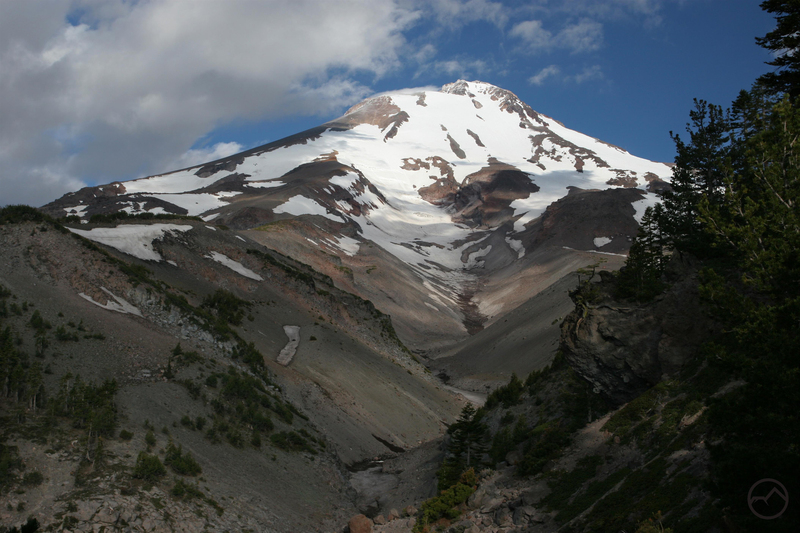 One such area that demands more attention is Ash Creek Butte, nearby the east-side trails on Mount Shasta. The road to this remote mountain is the same as that necessary to reach the Brewer Creek Trail. Where the latter turns west and climbs up Mount Shasta, the former heads east and climbs the flanks of unappreciated Ash Creek Butte. Here the intrepid will find some of the most fascinating and beautiful geology in the region. Small lakes, beautiful forests, sheer cliffs and incredible views wait. Other treasures are hidden the in the mountain fastness to the east. Of course, hikers should not forget the largely undeveloped potential of the Medicine Lake area as well. A remote waterfall in Mud Creek Canyon. There are many more surprises waiting to be discovered in the mountains and forests around McCloud. Studying maps and satellite imagery will give the keen of eye several destinations to explore. 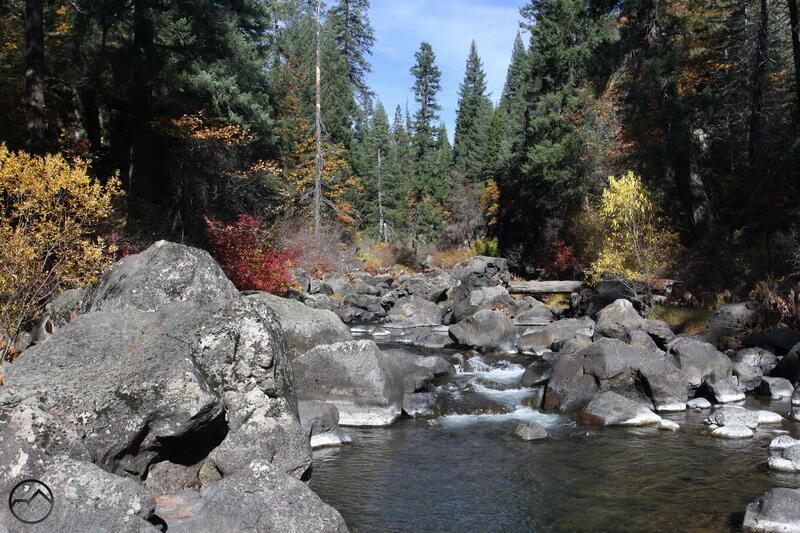 Whether it is massive Mud Creek Canyon on Mount Shasta or some of the remote creek drainages along the McCloud River, there are many beautiful and wonderful sights that await the explorer’s gaze. Even well-travelled but unappreciated places like the crossing of Mud Creek on Pilgrim Creek Road offer beautiful, pleasant exploration for those who have an eye for such things. Areas like this, mere minutes from the downtown area, demand development by the Forest Service. It is not outside the realm of possibility for McCloud to have a compliment of trails close to town similar to those around Mount Shasta City. However, with or without these, McCloud remains a highly underrated hiking destination. 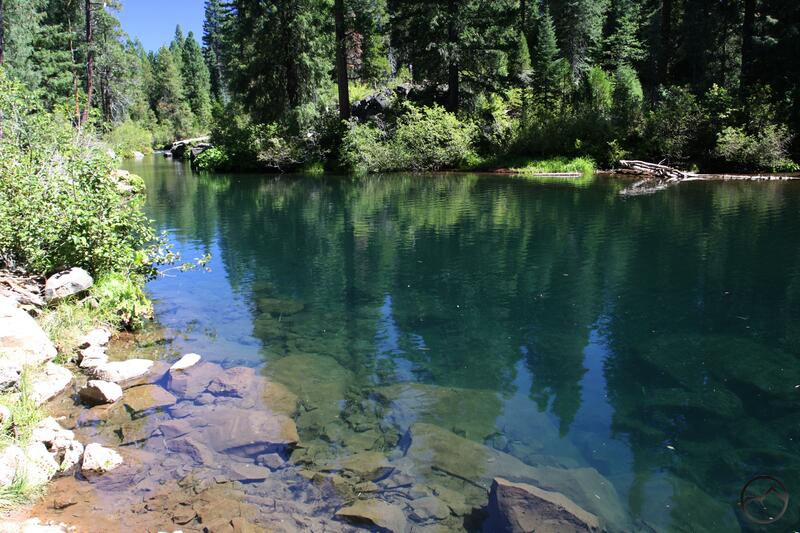 The McCloud River is one of the Mount Shasta region’s premier attractions. The river travels through scenic volcanic features, over spectacular waterfalls and through deep river canyons. Although the McCloud is a popular destination, one of its major physical distinctions often escapes notice. A quick study of the California Geologic Survey’s geologic map reveals that the river travels through two very distinct geologic regions. 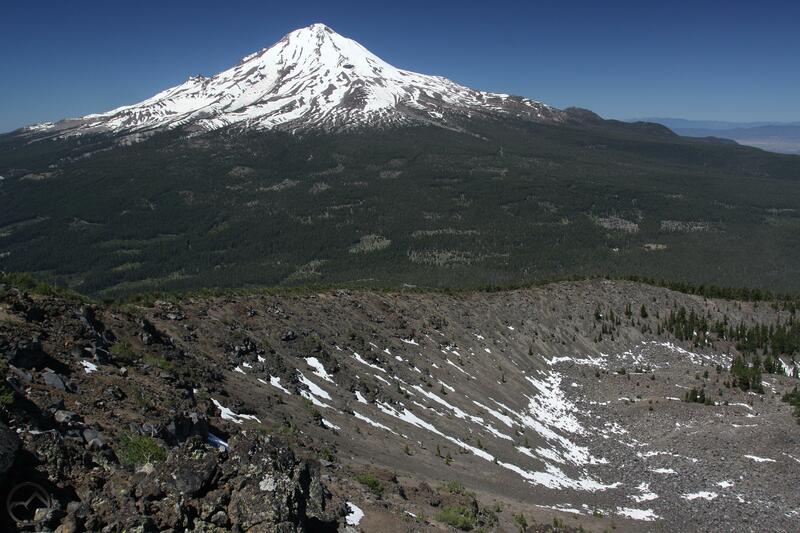 The upper section, which lies above the McCloud Reservoir, travels through volcanic terrain that includes features like columnar basalt and lava flows. Below the reservoir, the Lower McCloud enters a deep canyon which is cut into mountains that form a nameless outlier of the vast Klamath Mountains. Due to the disruption of the reservoir, the shift in the area’s geologic composition tends to go unappreciated. The change in geology creates two very different river environments. The upper section is identified by past volcanism. The lower section is defined by the exposed bedrock of the Klamath Mountains along the river, the steep walled canyons cloaked in old growth forests and numerous small creeks flowing into the McCloud. While the upper part of the McCloud along the falls is very popular with hikers, the section of the river below the McCloud is more remote and lacks the major draw of the upper portion’s waterfalls. 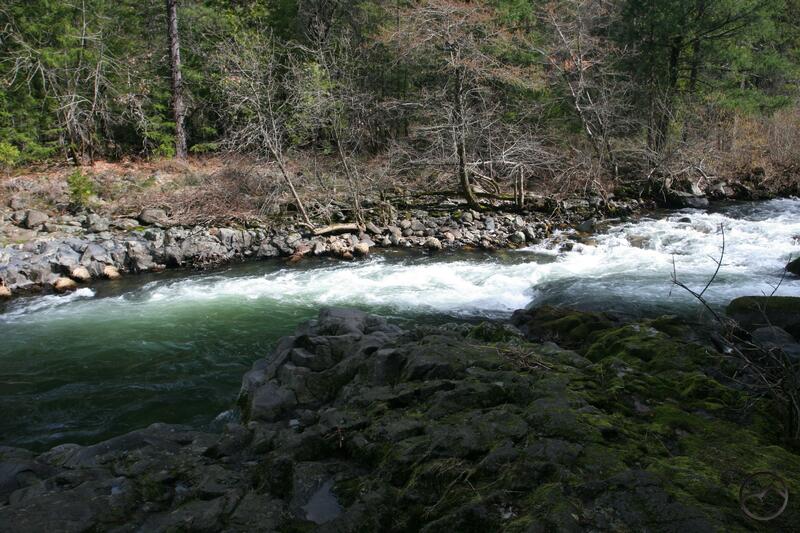 Consequently, the Lower McCloud River is a treat for hikers looking to immerse themselves in isolation. While the remote location of the trails along the lower part of the river does not make these trails good options for winter hiking because of the snow, in spring access is generally good. Indeed, spring is particularly attractive here. The river is engorged with snowmelt, the trees are leaving and wildflowers are blooming. The distinct geology and the isolation give this area a primeval feeling despite the presence of historic ruins and other man-made structures. The sense of being cut off from the outside world that permeates the Lower McCloud is especially welcome in the spring. After months of snow (theoretically, of course!) and trails near town, this part of the river presents an excellent opportunity to escape into the dark folds of the unnamed mountains south of Mount Shasta. 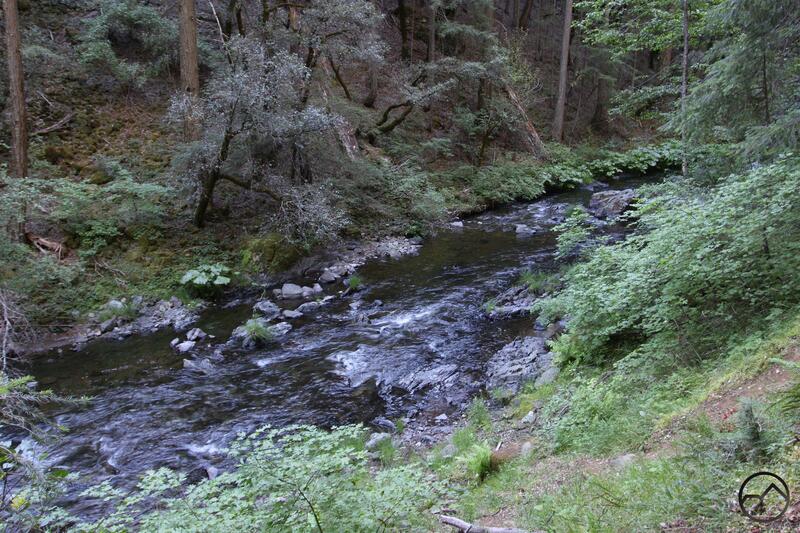 Three trails are found around the Lower McCloud River. 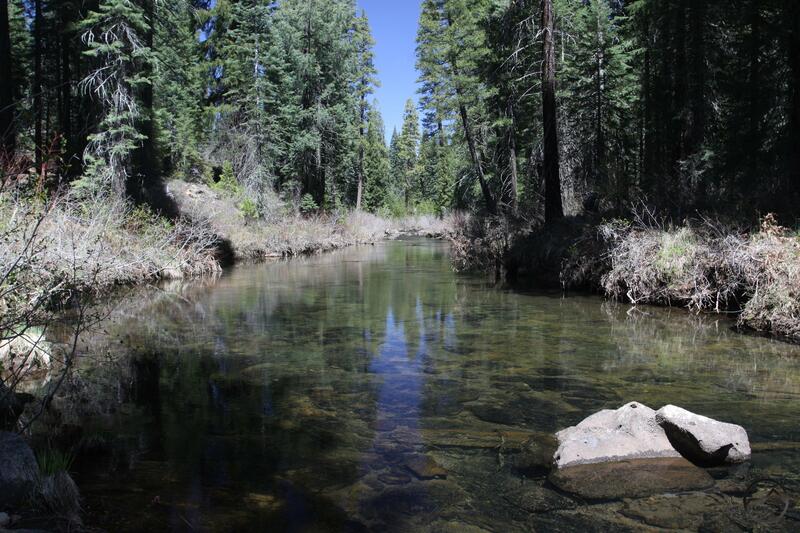 Two follow the river itself and a third follows Squaw Valley Creek, a major tributary of the McCloud that begins at beautiful South Gate Meadow, high on the flanks of Mount Shasta. 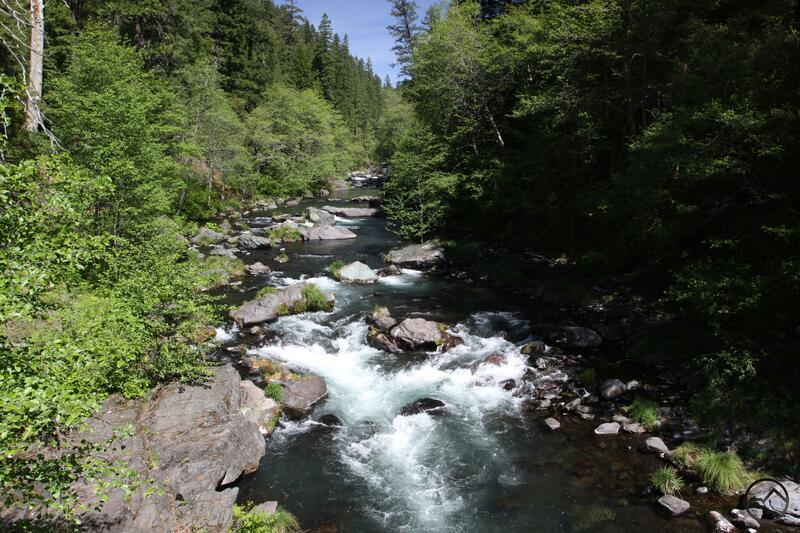 Despite not being on the McCloud River, the trail along Squaw Valley Creek has most of the essential qualities that define the trails along the Lower McCloud. It winds through a lonely canyon cut into rugged mountains, has lush riparian landscapes, and has great exposure to one of the region’s beautiful waterways. 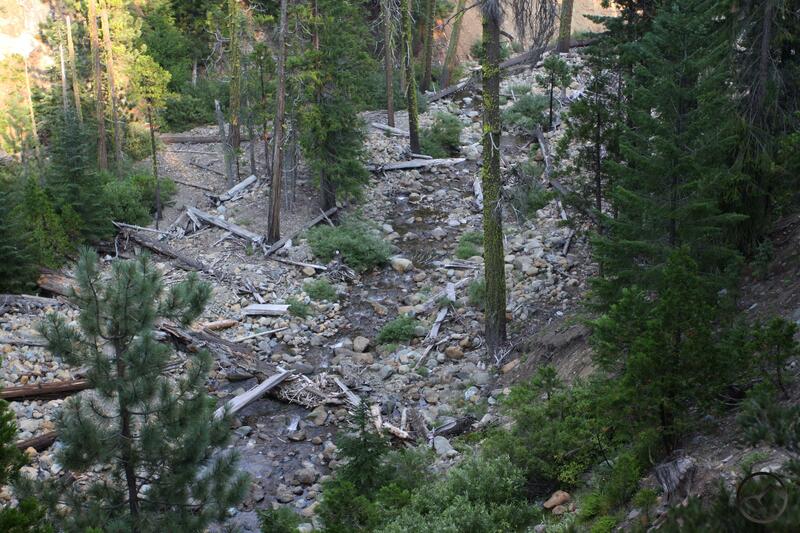 Squaw Valley Creek is large and swift moving. In the first few miles of the trail it charges through narrow rock gorges and plunges over a pair of small waterfalls. The trail maintains a constant, parallel course to the water and many short side trails provide access to the creek bank. Of the three trails in the Lower McCloud area, the Squaw Valley Creek Trail is the easiest to access. Consequently the trail receives somewhat heavier use than the other two paths. This should not be a deterrent, since the trail still receives light use. Another feature that sets it apart from the other Lower McCloud trails is the fact that it can be hiked as a loop by combining the Squaw Valley Creek Trail, the PCT and a dirt road that travels through a dark, secluded canyon. The Pacific Crest Trail, traveling from the border with Mexico all the way to the Canadian border travels only a few miles along the McCloud River. Due to the rugged nature of the canyon, the river stays high above the water, following a path that is slung across steep slopes. 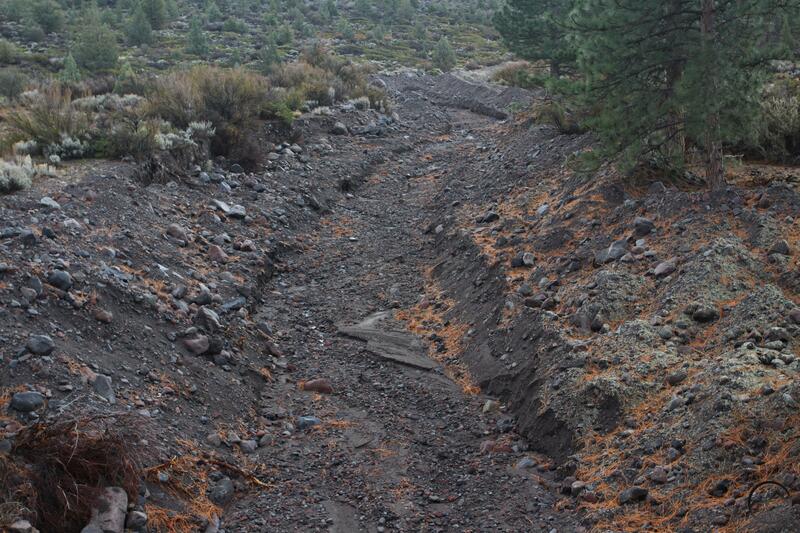 It is the trail’s separation from the river that has likely caused this section of the PCT to largely escape the notice of local hikers. Despite the lack of proximity to the river, hiking this trail has much to recommend it. There is good river access at the trailhead and great views of the McCloud at the beginning of the hike as the trail crosses a large footbridge. After that, even though the river and trail do not come close to each other, there are still plenty of opportunities to observe the water as it races through its boulder choked course. For those intent on enjoying the McCloud up close, there are several side trails that descend down to the riverbank. Some of these offer great views of awesome cataracts. The PCT eventually veers away from the river. Here hikers can continue on a dirt road a short distance to the remote Ah-Di-Na campground, where there is lots of great river access as well as historical ruins of a former fishing camp. The McCloud River Preserve is located far to the south of Mount Shasta, in the vast, seemingly unexplored mountains that lie between the mountain and Lakehead, where Shasta Lake begins. The preserve began as a private fishing club but was donated to the Nature Conservancy in the 1970’s. 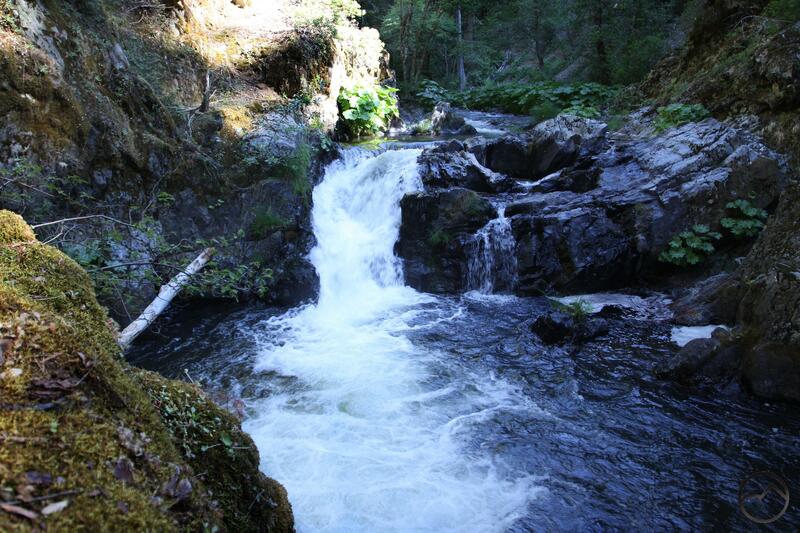 The preserve has one trail, which parallels the McCloud River through the heart of a deep, wild canyon. 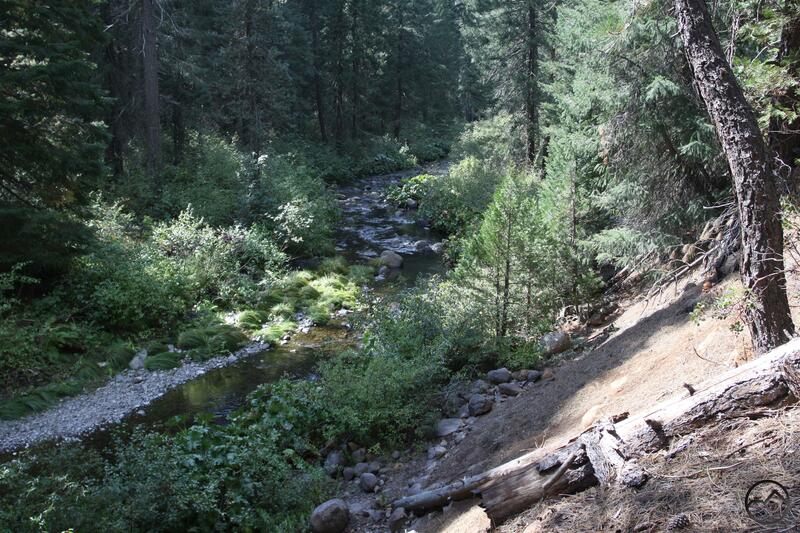 This is one of the most remote trails in the Mount Shasta area. The long, bumpy drive to the trailhead gives a good indication just how far off the beaten place this is. The trail is a fantastic riverside path. With only a few short exceptions, it runs right along the water its entire length, skirting ancient forests and cutting across large sections of exposed bedrock. This part of the McCloud is very different from it more famous upstream section where the falls are located. It is much wider here and dotted with boulders. In contrast to the flat terrain of the falls area, the depth of the McCloud’s canyon is evident along the Preserve Trail. When the route finally peters out, the river continues its journey to south, into the rest of California. One interesting opportunity that this area presents is the possibility of spring backpacking. Starting at Ash Camp, hikers can make the trip down to Ah-Di-Na and set up camp. From there it is another mile walk down the dirt road to the McCloud River Preserve trailhead. The preserve would make a great day hike before returning to camp. It is possible to return to Ash Camp the next day or spend another day at Ah-Di-Na enjoying the river and exploring the ruins. Some years the route of this hike would be free of snow before the long bumpy road into the campground is open. This means that backpackers could enjoy Ah-Di-Na and have the campground to themselves, further adding to the area’s sense of isolation. 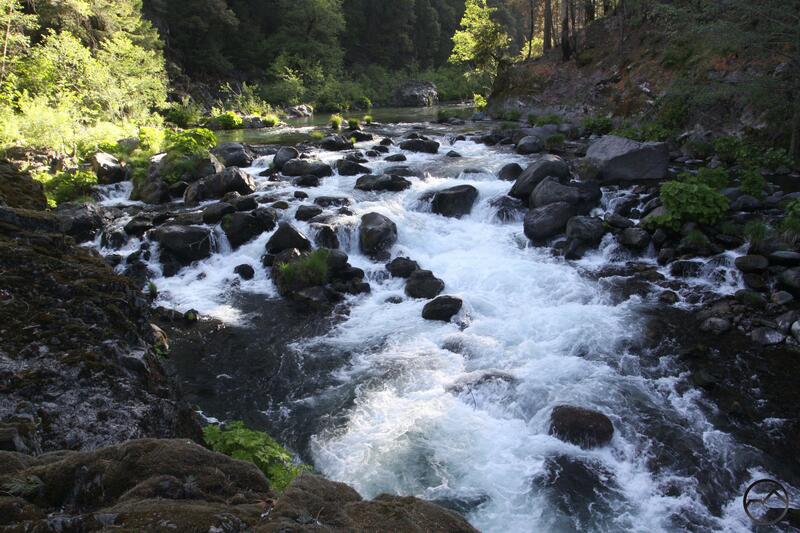 The McCloud River is one of the premier attractions in the Mount Shasta area. The river is famous with anglers, waterfall aficionados and those who generally love beautiful mountain rivers. The vast preponderance of users justifiably head to the three falls on the river. The trail to the three cataracts is easy, gorgeous and has major payoff for little effort expended. 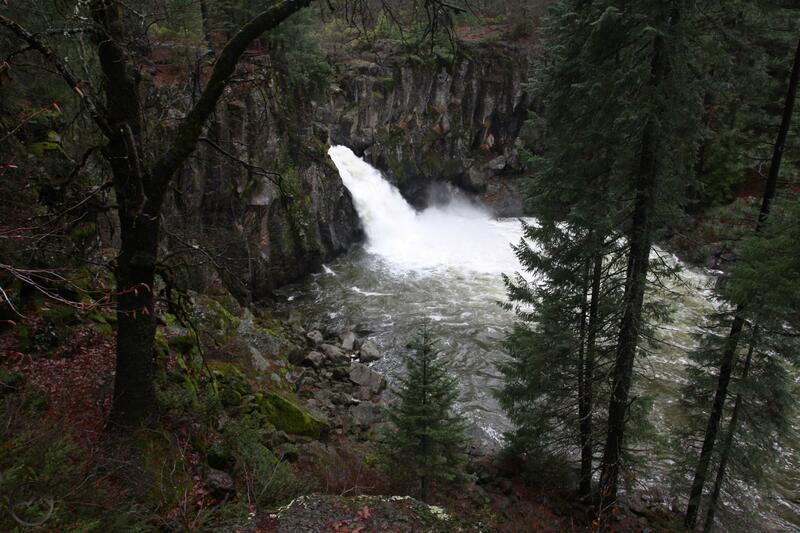 What most hikers do not realize is that the McCloud River Trail is much longer than the section by the waterfalls. 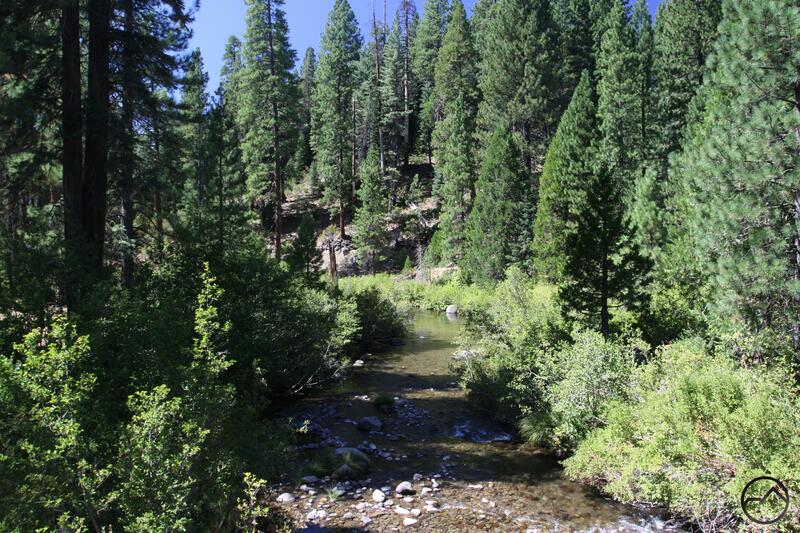 It begins many miles upstream, deep in the forests of the McCloud Flats. The trailhead is located at the Algoma Campground, which is only 2.5 miles west of the small outpost of Bartle. From Algoma, the trail runs parallel to the river for 15 miles, passing through shallow canyons, meadows, old growth forests and along basalt gorges, deep swimming holes and beautiful waterfalls. Season: all year (access roads to Algoma and the falls area are not plowed and may be covered in snow at times during winter but other sections of the trail are easily reached directly off of Highway 89. Like the descriptions of the trail segments, this overview will begin at the Algoma trailhead and recount the entire journey to the end of the Pine Tree Hollow Loop. This is one of the prettiest sections of the McCloud River Trail. Beginning at the bridge over the river that lies adjacent to the Algoma Campground, the trail quickly enters a shallow canyon and follows the river as it races through a swift moving section. This part of the trail feels far removed from civilization because it is the furthest section from McCloud but also because the canyon shields it from outside intrusion. The canyon eventually comes to an end and the river flows through a broad flood zone that is choked with brush. The water is not visible from some sections of the path but the sound of rapids is still visible. The river and the trail rejoin just before arriving at the Skunk Hollow Campground. 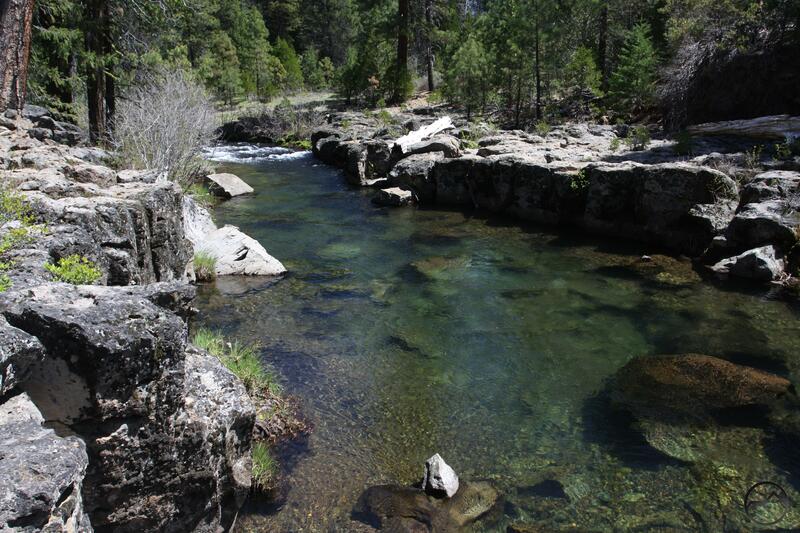 This primitive area has campsites right next to the McCloud River. The hike continues a short distance past Skunk Hollow before arriving at the Nitwit Campground, another primitive campsite. This is a good place to turn around and return to Algoma. This is one of the least interesting sections of the McCloud River Trail, but this does not mean that it lacks beauty. The culprit for the trail’s lack of interesting features is a large flood area. The path is routed well away from the river to avoid flood damage. Consequently, there is extended passage through forest that is typical of the McCloud Flats. While this is beautiful in its own way, hikers are understandably eager to return to the river. Despite this, there are still some noteworthy features along this part of the hike. After departing from Nitwit Camp, there is a wonderful and remote swimming hole. This is one of the best swimming spots along the entire River Trail. The highlight, however, is the trail’s end at the Cattle Camp Swimming Hole. Here there the water rushes through a small basalt gorge, flanked by short cliffs. The swimming hole itself is a large, deep pool, emerald pool. The section of the McCloud River Trail that connects the Cattle Camp Swimming Hole with the Camp 4 Group Camp is one of the trail’s least used segments. What it lacks in use it makes up for in beauty. Beginning at the scenic swimming hole, the path weaves through another shallow canyon for several miles, following the contours of the river as it races over numerous small rapids. The canyon is narrow enough for fallen trees to span the river comfortably, providing opportunities to walk out over the water. This section ends at the Camp 4 Group Camp, a seldom used campground with tall trees set amidst a small grassy meadow. The sunshine at the meadow is a pleasant change after hiking along the river in dense forest. 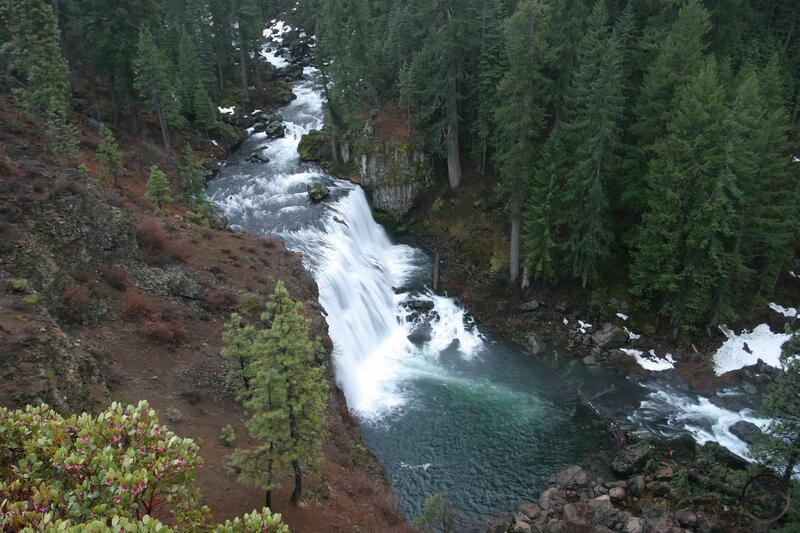 The hike from Camp 4 to Upper Falls is one of the most diverse portions of the McCloud River Trail. The path initially follows the river as it winds through the forest. It soon veers away from the water as the McCloud enters another broad flood zone. When the trail and river meet again, the path crosses over a dirt road. Following the road to the left for a few yards leads to the Bigelow Bridge, a gated road bridge over the river. Below the bridge is a large, lovely swimming hole flanked by beaches. It is a great spot to enjoy a dip in the river. Once across the road, the trail resumes and follows the McCloud a little further before arriving at a large bayou-like area where the river flows through many channels that cut through large clumps of brush and trees. The bayou area is formed by the Lakin Dam. This was originally built to impound the river for diversion to the sawmill in McCloud. The water is no longer diverted but the dam remains. The water cascades over it in a small waterfall. Beyond the dam the McCloud becomes swifter and volcanic geography becomes more pronounced in the form of basalt outcroppings and lava flows. This section of the trail ends at the Upper Falls, the uppermost of the McCloud’s famous trio of cataracts. The hike connecting the three waterfalls on the McCloud River is one of the most popular hikes in the Mount Shasta area. Hikers typically start at the Lower Falls and turn around after enjoying the Upper Falls. The hike can easily be done in reverse order if so desired. It begins with a bang as the river shoots through a deep, rocky sluice before hurtling through a notch in a large basalt cliff, plunging down into a deep pool. Past Upper Falls, the path skirts the edge of a deep canyon, arriving at awesome Middle Falls in short order. The most impressive of the three waterfalls, the cataract is wide and tall. After descending a set of wooden stairs and some switchbacks, the River Trail finally returns to the river. The route continues downstream through the canyon. Large boulders litter the path and occasional collapsed areas mark the cliffs on the opposite side of the river. The trail passes the Fowlers Campground just before arriving at the Lower Falls, which has a large picnic area. It is a spectacular section of trail. Overlooked by most hikers who begin hiking at Lower Falls, the one mile long Pine Tree Hollow Loop is the most scenic stretch of the entire McCloud River Trail, aside from the superlative section along the falls. The loop initially follows the rim of the canyon above the river. Small sections of columnar basalt can be seen in the canyon walls. The trail eventually descends down into Pine Tree Hollow, a large flat area hemmed in by cliffs on three sides and the McCloud River on the fourth. The trail then bends back upstream and runs parallel to the rushing water. Large boulders dot the river’s path, which makes the water’s journey quite raucous. A short series of switchbacks lead the trail back up to the canyon rim, where it is just a short walk back to the Lower Falls. If beginning the hike along the waterfalls at Upper Falls, this loop makes a great addition to the trip or it can be enjoyed on its own. Between Lakin Dam and Upper Falls.